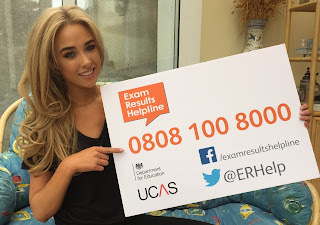 The team at Exam Results Helpline are so happy to have the lovely Nicola Hughes from Made in Chelsea promoting the helpline this year. 'I grew up in Ireland and so instead of GCSEs we did the inter cert and I was so pleased that I passed all of my subjects. I then went on to do the Leaving Certificate in Ireland which I think is equivalent to A Levels over here and I passed all of those too! During the exam period, I found parent pressure very overwhelming. Obviously they wanted the best for me but I was already putting enough pressure on myself and to try to manage their expectations too sometimes got a bit much. I found that studying with my best friend was a good way of staying calm and not getting too worked up about it all. I was really nervous about getting my exam results, I was terrified that I’d let my family down. I have always been very critical of myself as well and so I was really happily surprised when I found out that I had managed to pass them all. After finishing my Leaving Certificate I went on to study Computers and Multimedia. However, I was lucky enough that my modelling career took off and I had to take a break from studying. I’ve always been a creative person and had ambitions, and still do, to work in the world of multimedia films such as Avatar. The modelling led to other opportunities and the next thing you know I’m on Made in Chelsea! Apart from the dream of going to Hollywood to work on films, I had no idea what I wanted to do after I had finished education – it feels like a major decision. That’s why I think it can be good to take some time out and try to find out what you are good at and what you enjoy. I’m still very much on that journey! In the immediate future I am hoping to do some TV Presenting work. I worked in Canada last year to gain some experience and a film crew came out with me and filmed my experiences for a series called ‘Exiles’ which is currently being aired on RTE Television in Ireland.